Yesterday, Duchess Meghan, 37, headed off on her first official visit to the place with which she shares her title, Sussex, with new husband Prince Harry. She opted for a largely green ensemble for the trip down South, but one item in particular caught the eye of fashions fans on the day. Meghan stepped out in a shirt from high street brand, & Other Stories, which cost just £69. She wore the blouse loosely unbuttoned and tucked in to her leather skirt with the sleeves casually rolled up. It’s one of the most affordable items of clothing the Duchess has worn yet in her royal career – next to a £45 Marks & Spencer jumper she wore on one of her very first engagements. And just like with the Duchess of Cambridge, the Meghan effect well and truly rolled in to effect after she stepped out. 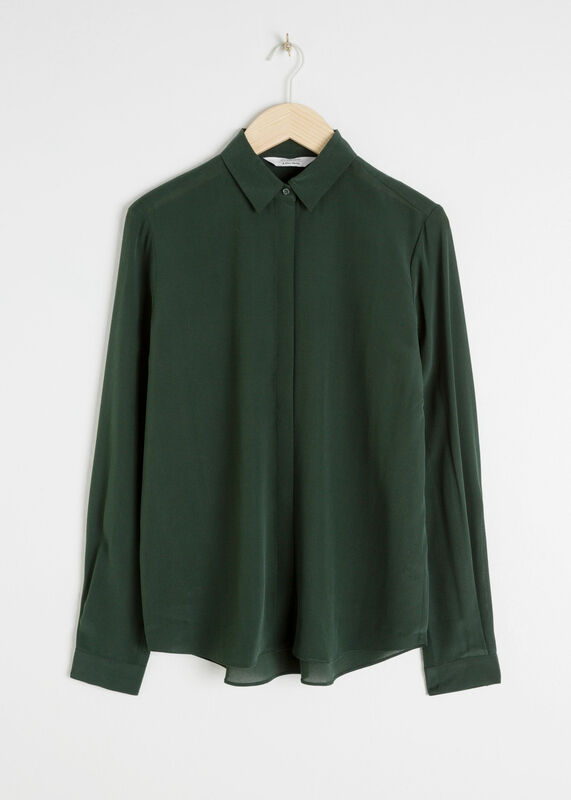 The long sleeved, collared shirt has already sold out in four colours on the retailer’s site. 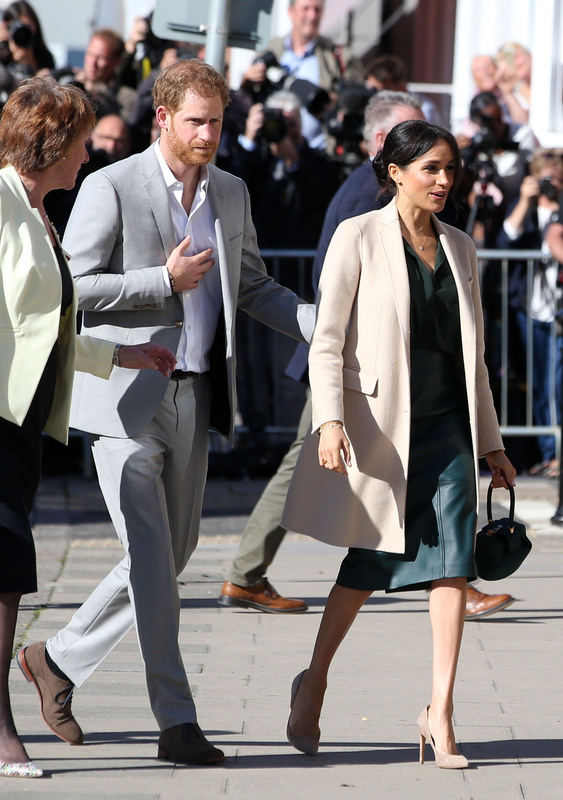 However, luckily, the & Other Stories piece is still available in the dark green Meghan wore, and several other colours, including a light blue, black, and white, on the website. You can still buy it here. Proving once again she can look effortlessly chic, she mixed the high street shirt with designer pieces including an olive coloured, leather pencil skirt from Hugo Boss, Stuart Weitzman heels and a Gabriel Hearst Tote bag. Now that she’s royalty, Meghan will have her fair share of expensive jewellery to choose from. But the down-to-earth former actress opted for more understated accessories for the trip to the south coast. 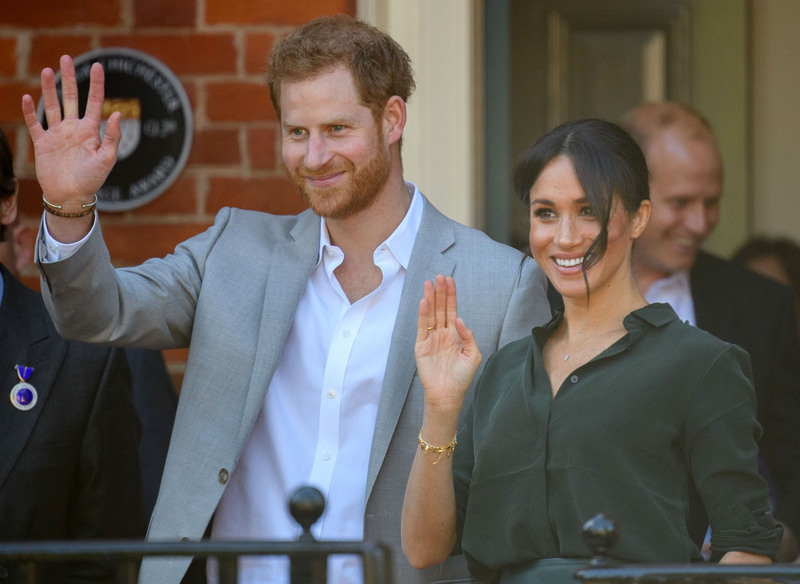 Wearing a large gold signet ring, £85 and gold leaf bracelet, £75 from online jewellery store Missoma, her choice in clothes and jewellery proves you don’t have to spend lots of money to look like royalty. Sadly, the signet ring has now sold out, but the gold leaf bracelet (seen on the Duchess below) is currently still in stock. During the visit, the couple were presented with gifts from local schoolchildren in Chichester, including an A-Z guide of the area. Afterwards they made their way to the coast to visit Bognor Regis where they officially opened the University of Chichester’s Engineering and Digital Technology Park. To finish the day, Meghan and Harry headed to the Survivors Network in Brighton, which helps survivors of sexual violence. The Duke and Duchess were, adorably, presented with a sweet drawing of their pet dog Guy whilst there, which they both seemed utterly delighted with.